Now that we've drafted the front and back sloper, we need to put them together for a couple more checks before they are ready for the sleeves or (if meant to be forever sleeveless) the first muslin. (ii) the armscyes join up to make a full armscye. I had to flip my back sloper over and redraw the edges and reference lines on the backside to do this. Q: What's the purpose of this check? 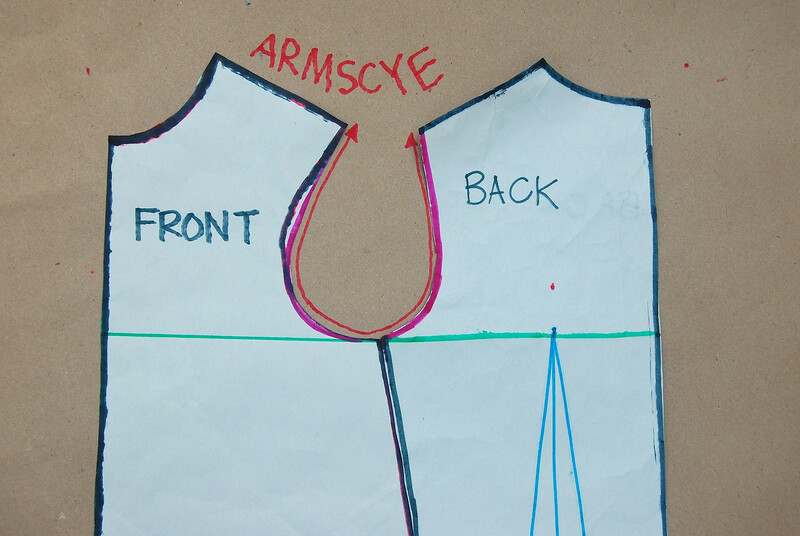 A: The neckline and armscye were hand-drawn (or ruler-aided) curves so it is a good idea to double-check to ensure they will fit the wearer. First, we will check the neckline for overall fit. 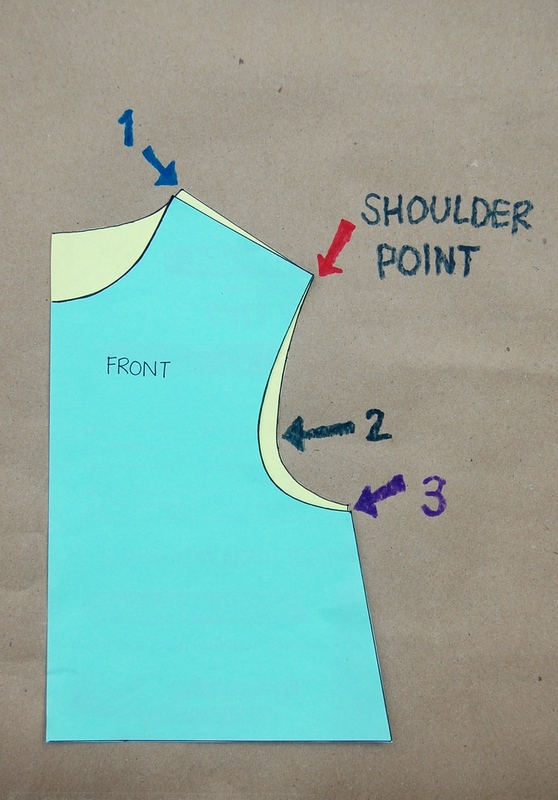 On your combined sloper draft, measure along the neckline curve from A to B as shown in that first picture. Remember that our slopers were drawn for just one half of the body, so you will need to double this neckline measurement (i.e. 2 x AB) to get the entire sloper neckline. 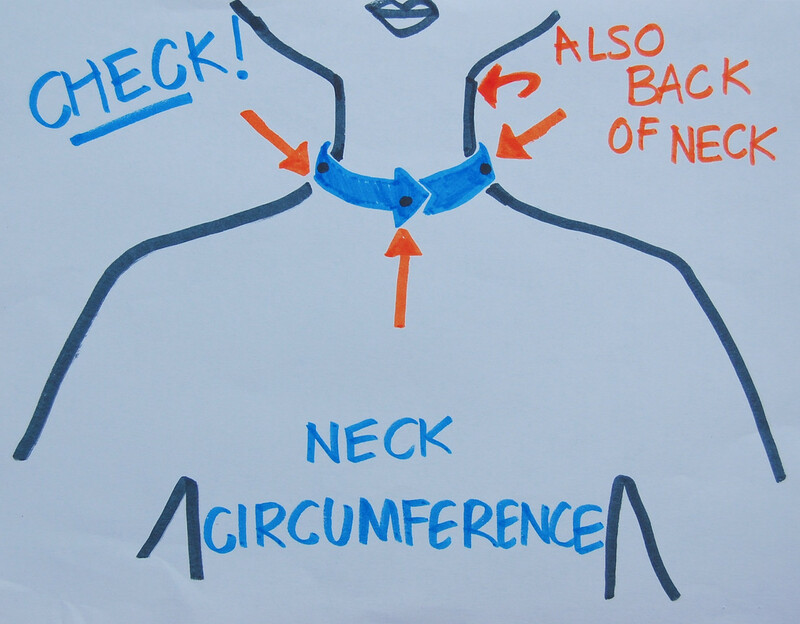 Next, measure the circumference of the child's neck (measurement #6, if you are using the Measurement Table Worksheet), being sure the measuring tape passes over the four points - the two Side/Base of Neck points, the Hollow of Neck point and the Back of Neck point. Make this a snug but not tight measurement. Imagine this will be a well-fitting button-down shirt collar or a mandarin collar when it is made into a garment, and hold the measuring tape as snugly or loosely as you would want that collar to fit. My sloper neckline was 11.75" and my neck circumference, as measured on the child, was 11.5". This is good. You'd want the sloper neckline to be the same or a little bigger than the actual measurement on the child. If it is smaller, your sloper neckline is too small (tight). You can enlarge it by tweaking the curves a little or, if necessary, lowering the neckline slightly in the front. Q: What does this mean on a garment made from a sloper with a too-small neckline? 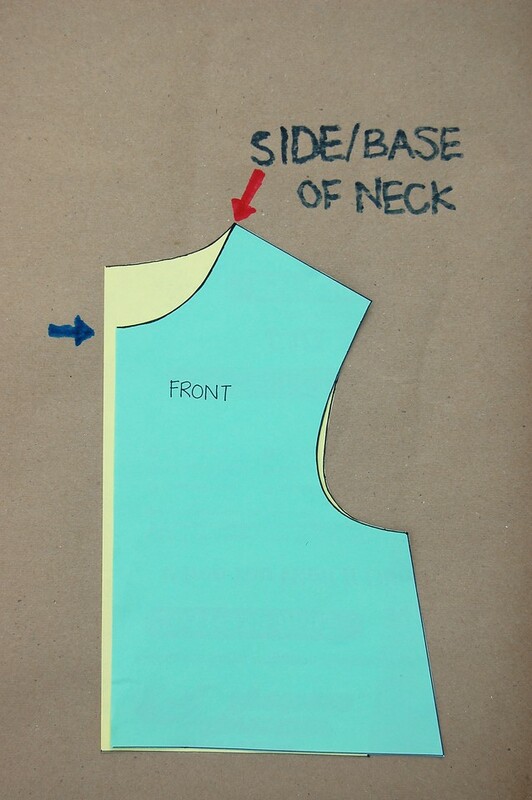 A: Remember that the neckline was measured without ease. You wouldn't be able to fasten that garment at the neck. For example, if you fastened it with a back zipper, you wouldn't be able to zip it all the way up. If you fastened it with a front overlap button panel, you wouldn't be able to do up the top button. Second, we will check the armscye for overall fit. Measure the armscye of the draft as shown, from X to Y. Like the neckline, the draft armscye should also be close to the measured value. My draft armscye and the measured armscye were both 11.5". Unlike the neckline, however, the armscye was measured with some ease, so there is some room for deviation. If, however, the draft armscye was much smaller (more than an inch) than the measured value, it could mean a very uncomfortable armpit in a set-in sleeve. You can enlarge it by tweaking the curves, or lowering the bottom of the armscye by 1/4" and redrawing it. 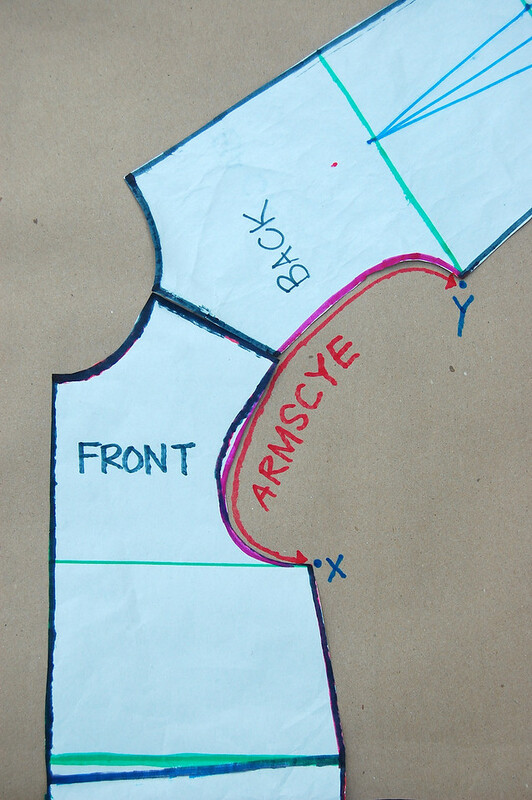 If the draft armscye is much bigger than the measured value, your armscye is too loose - raise the bottom of the armscye by 1/4" (or more as needed) and /or redraw the curves. Here are a few more interesting observations from putting the front and back slopers together. I traced out just the upper portions of the slopers on different colored paper using a finer-nib pen for better effect. The front is green and the back is yellow. The back of the neck is slightly wider than the front (blue arrow). But just slightly! This is because of the muscles and bones (like that vertebra!) on the back of the neck. All these make for a rounder back of the neck. The front of the neck, by comparison, is flatter. 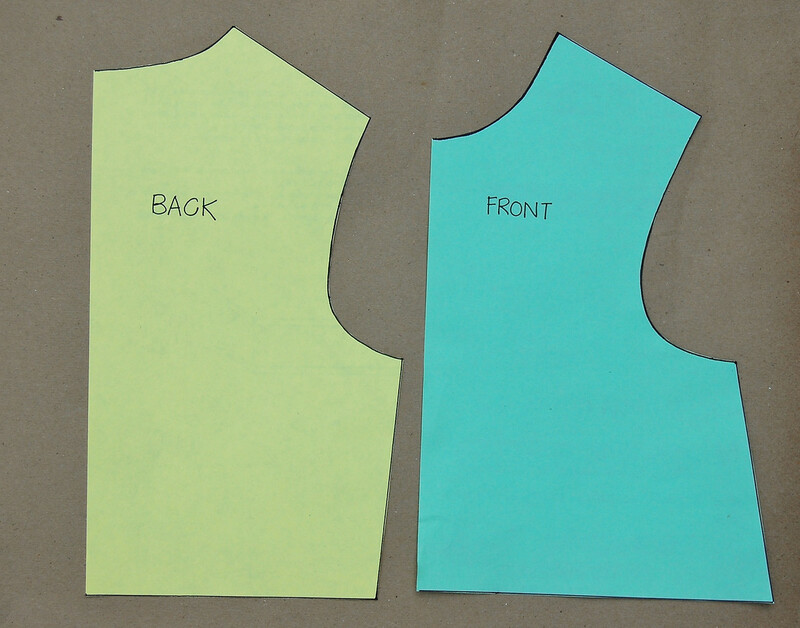 You will probably not notice this in garment patterns that have already been adapted, particularly those with low or wide necklines that have their seam lines far away from the base of the neck. The Side/Base of Neck Point (Blue Arrow 1) is slightly higher in the back than the front. Again, this is due to curve of the back because of the back muscles etc. People with rounded backs, especially, will feel the effect of this if they use a pattern that does not take this into account. My aunt remembers wearing dresses made by her mother that always pulled her front neckline towards the back because of this. 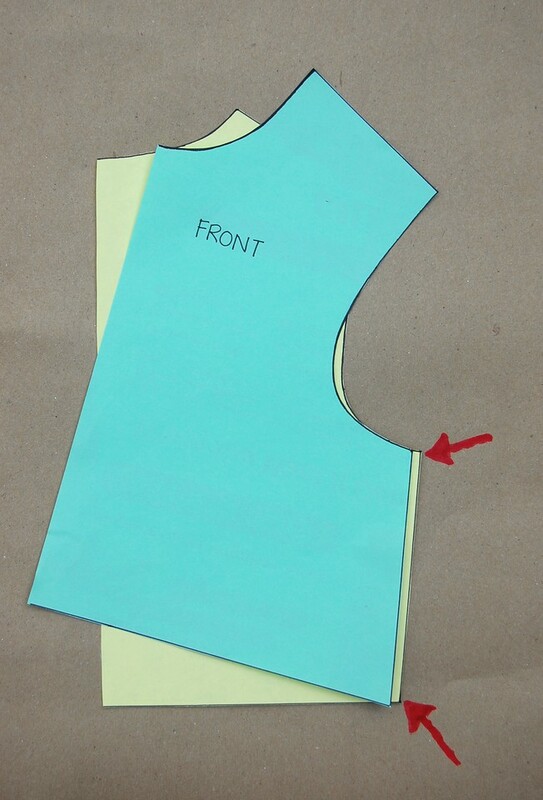 When this aunt eventually started sewing her own clothes, she drafted the back Side/Base of Neck point a little higher than the front and never felt choked again. Q: Er, what do you mean by a "higher Side/Base of Neck point"? Which measurement did you take that reveals this? A: In the Measurement Table, compare #1 and #19. It is a very slight difference, if at all. The effect is only felt in a sloper, where the neckline is snug. In patterns with wider or lower necklines, you won't see this effect at all. 1 The shoulder slope is also not the same for front and back. 2 The bottom of the armscye (Purple Arrow 3) is higher in the back than the front. Because we measured this bottom of armscye value from that Side/Base of Neck point (#10 and #27). The shoulders in this sloper are the same width in the front and back. There are exceptions, of course. People with rounded backs or who have shoulders that lean forward may have a wider back shoulder width than front. People with very developed back muscles (like sportspeople) might also fall in this category. Their slopers will often include shoulder pleats to shape the fullness in this area. But this is usually not the case for children. 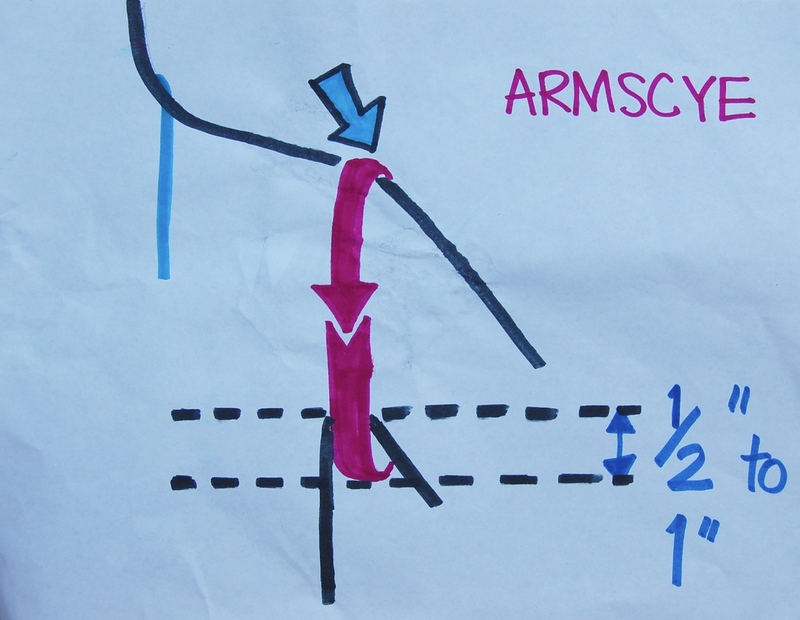 The front armscye is deeper (more curved) than the back (Black Arrow 2). This allows for the arms' greater movement in front of the body than the back. In spite of all the differences between the front and back measurements, the Chest to Waist distance (between the red arrows) is the same for front and back, so that when sewn together, the side seams are the same length. And that brings us to the end of the How To Draft The Full-Body Sloper section of our series. Was that all too much information for you guys? I am guessing yes, and I'm sorry if you've passed out in front of your computer. I chose to include it because it helps you appreciate that drafting is a lot more Whys than Hows. 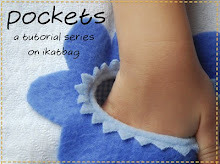 A drafting tutorial is so different from a tutorial to, say, sew a tote bag. And this is just for a child - drafting for a woman's form is another level altogether. Still, once you've understood the principles (and so many of those we've explored for a child are transferrable to a woman), you're so much better prepared to draft clothes that will really fit well. And now, the sloper is ready for a sleeve! Or a muslin, or both! Time to go shopping for fabric! Whee! I'm tired and don't feel like doing a post on how to analyze fit. I think it is safe to let you guys go and try it out yourself. It will be practically self-explanatory when you see the muslin on its model. One thing I'd like to recommend, if you will humor me: buy cheap fabric that has checks on it. "A muslin" (we called them "mock-ups" in Singapore) does not have to mean it is made of muslin fabric. If I can find it, I buy cheap (like $2 a yard) fabric that is in a plaid or some other kind of check or even striped pattern. Some drafting resources recommend gingham but that can be expensive. Checked fabric is like a grid - you can make symmetrical alterations without having to actually use your measuring tape. Next up is Jen from My Measuring Tape! I am so excited that you'll get to meet and work with her. She will be taking you through sleeve drafting and the adaptation of the sleeve block to design different sleeves. Also the adaptation of the basic sloper neckline for different necklines. And using the sloper to work with commercial patterns. It's not often that you get to learn all this stuff from a professional tailor. Enjoy! I'll see you at the end of the series to take you through a series of different tailored pockets to jazz up your garment sewing. But I'll also be popping in now and again with some random project or other! I can't even begin to tell you how much I've learned from this series! It's been incredible and I'm so grateful. You're a wonderful teacher! I'll be spreading the word about this valuable series of posts. Thank you so much for that series ! It's great, and I understood a lot more than from other drafting courses I read before. I am so excited to see your posts on drafting. I have read three different drafting books and just been confused. I think I am ready to try again with this tutorial. I do have a question though, how "often" do you draft new slopers for your children? Each season? Fall, Winter, Spring, Summer? or just twice a year? After a big growth spurt? What have you done in the past ? What do you recommend? Thank you again for your fabityfabfab tutorial. thank you thank you thank you for posting this series!!! My shoulder seams Do Not ALign AT All. The back is hlaf an inch longer than the front. THis means either the neckline or armsyce is shonky depending on which one I chose to align. My model is, I guess ,about the same age as yours given our comparable measurements. THe only places I can see that mine differ wildly from yours are the width of neck ones. Is this why my shoulder seams are so wrong? DO I have to redo ALL my measurements with a fidgety model? 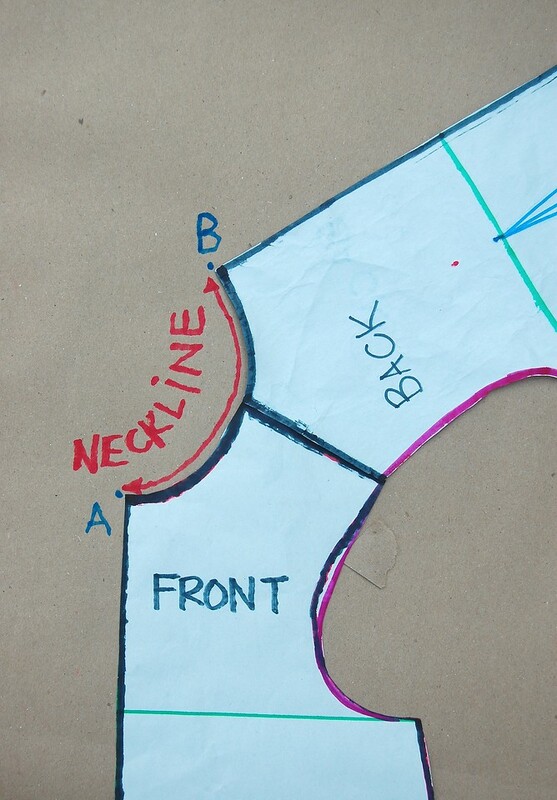 Lin2Too: How did you mark (on your child's body) the shoulder point and the side/base-of-neck point? If you marked them with an actual marker (e.g. a sticker or a pen) you should have the same measurement for front and back, because you are measuring between the two same points each time, even though it is a horizontal measurement. If you didn't mark them with an actual marker, estimating the measurement might have resulted in the half-inch difference. Also if your child was shrugging her shoulders even slightly, the shoulder point could easily be raised by half an inch or more. So if her arms were resting and hanging vertically when you measured her shoulder-point-to-waist distance in front but she was shrugging when you measured the same thing in back, it could explain the huge difference. Try this: Grab the child, mark the shoulder points of both shoulders and measure between those points in front and in back (#3 and #21). They should be almost the same, give or take a quarter inch (unless your child has a very rounded back - which you will know if she tends to hunch A LOT). If they aren't, then the one that is off by a huge value is the wrong one. Email me if this doesn't help, OK? Thanks for takig the time to respond Lier. I held up the paper against the model and its so clear now where the errors are. THe angle of the shoulder seam on the back is way too sharp - it dips downwards horribly. The front is an inch short to the waist. I did stick dots on her but there was A Lot Of Fidgeting occuring during the measuring. I do remember that the waist tie did droop alarmingly about half way through. And I guess she must have been shrugging too. I shall try measuring again and give it anpther go this weekend. If I still can't sort it out, I'll take you up on your generous offer of email support. Dear LiEr, I have similar problems like Lin2Too... it worked fine with my 10 year old daughter, but my 3 year old... I've taken the measurements twice on different days, but it could have been two different kids for all it is worth... :( the points if alligned like you did, nothing fits, the shoulder slope, the arm scye, the neck...... buhu.... where is my nutella? I'm to inexperienced to correct it "on sight", and it worked so so good with my older kid. Guess i have to go with sewing for my older one and wait a few years on the little one. Your series is so great, thank you so much for teaching it!! Hi Lier, I dont have a child to measure and would love to learn how to do this. I consult books for measurements but they call the body parts different names and they have so much info! I found a free measurement guide the internet. Is there anyway you could tell me which numbers match up to the areas you measured? This is the link - https://docs.google.com/file/d/0By72I5Ds_yZEbTE0aDNaTTBSTnM/edit?pli=1 Please help. Anonymous, I just took a look at the document and without seeing an actual diagram that defines their various terms, I, too, can't tell what they mean. Bust, chest, waist are easily understood as measurements around that part of the body, but I am not sure what shoulder slope, full length, centre back/front length are. We could assume they are the measurements to the waistline as a reference line, which would make sense, but it's hard to be completely sure without a diagram. 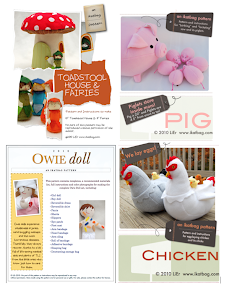 I have just discovered your site & omg... so simple yet detailed. I haven't tried it out yet but I have read over it quickly & it is making a lot of sense, I am a novice sewer/pattern maker doing a lot of self research, & it is very difficult to make sense of the lines in many other slopers made by others; especially when they tell you (for example) to add your hip measurement 4 inches to the right. That confuses me because I'm thinking why "4 inches" to the right... & what is "4 inches" to the right, is my hip measurement being connected to my hip measurement or something? what does the "4 inches" represent. I really hope that example/rant made sense. Anyways, to the question. I see you have made a front sloper & back sloper seperately, I have seen many tutorials where they make the front & back at the same time, on the same sheet of paper, I was wondering do you know how to do that? if so, would you recommend it? in your experience is it more difficult or simpler? I know that this is a few years old, but I am just discovering this wonderful work. A thousand times thank you!! I have wanted to be able to do this for years, but never brave enough to go there. I have had some good chuckles and memories; I remember well as a child my mother working this process. I realized that as an adult I love the feeling of my tape measure hanging from my neck. I thought that it was just part of the creative process; it is but I realized it also recalls the feeling of the tape measure on my neck,shoulders, etc. through this measuring process. 60 years later my memories are deep and the love of sewing that my mother and her tape measure instilled grow stronger. Thank you again - and know that those precious strawberry stickers may raise another generation of talented seamstresses in your family!